Nano-scale materials are proving attractive for a new generation of devices, due to their unique properties. They are used to create fast-responding sensors with good sensitivity and selectivity for the detection of chemical species and biological agents. Nanosensors for Chemical and Biological Applications provides an overview of developments brought about by the application of nanotechnology for both chemical and biological sensor development. Part one addresses electrochemical nanosensors and their applications for enhanced biomedical sensing, including blood glucose and trace metal ion analysis. 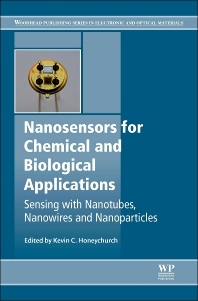 Part two goes on to discuss spectrographic nanosensors, with chapters on the use of nanoparticle sensors for biochemical and environmental sensing and other techniques for detecting nanoparticles in the environment. Nanosensors for Chemical and Biological Applications serves as a standard reference for R&D managers in a range of industrial sectors, including nanotechnology, electronics, biotechnology, magnetic and optical materials, and sensors technology, as well as researchers and academics with an interest in these fields. Kevin C. Honeychurch is a Research Fellow in the Centre for Research in Biosciences at the University of the West of England. He is a Member of the Royal Society for Chemistry (MRSC) and a Chartered Chemist (CChem).